ISIS Wanna be's ANTIFA Members Arrested With Homemade Bombs, and Dynamite! 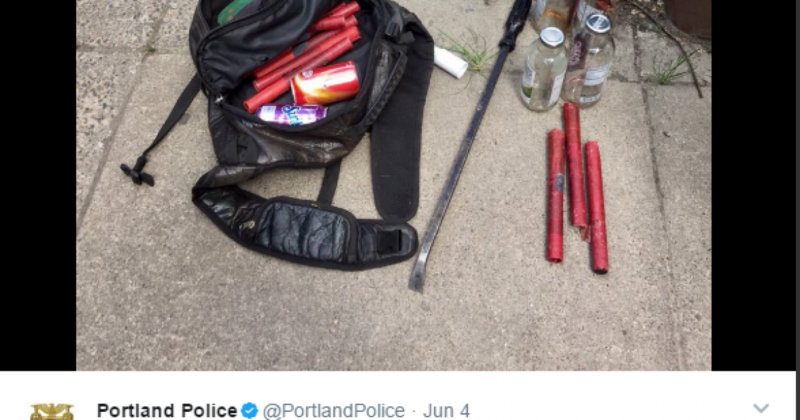 ISIS Wannabes ANTIFA Members Arrested With Homemade Bombs, and Dynamite! The Alt-Left protesting Freedom of Speech caused trouble on June 4th. Not only did the Alt-Left mascots known as AntiFa assault conservatives, police, and even regular bystanders, but they brought weapons. Nevertheless, the MSM has done their best to obscure AntiFa as a terrorist group. Yet, in describing Conservatives, they continue to use words like alt-right, white supremacist, extremists, and more. Since when has the alt-Right brought dynamite and other IEDs to rallies? Some have even gone as far as to claim that AntiFa were the victims. These terrorists threw bricks and glass bottles at police officers in Chapman Square. Even worse; AntiFa members also hurled bloody tampons and rubber balloons filled with feces at Trump supporters and police officers alike. But this was not even the entirety of their arsenal, as we hinted earlier. But, they were the victims right? Ironically, even though the Trump supporters didn’t get arrested, fight with the police, or get weapons or shields confiscated. Portland Police, Homeland Security, The Oregon State Patrol, and The Multnomah County Sheriffs Office proactively seized weapons from AntiFa, as they arrived at the location. As you can see below, there were sticks with sharp objects attached to the end and makeshift La Cross Tossers for hurling projectiles. Tons of sticks and other various items were also confiscated from AntiFa. Once the officers started to arrest people, more items were seized. Wrenches, scissors, chains, bricks, bats, knives, hammers, and road flares were only the tip of the iceberg. PVC Pipes, dynamite, Molotov Cocktail materials, fireworks, and other improvised explosive devices were confiscated from various individuals. To read the rest of the story please click HERE!